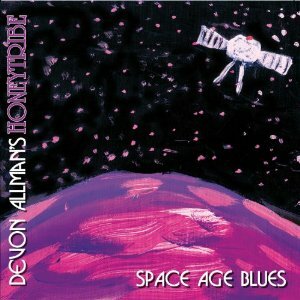 Devon Allman’s Honeytribe - "Space Age Blues"
Devon Allman is the son of the famous Gregg Allman but you don’t really hear it in his voice that much, just his heartfelt songs that he has created on this, 2nd record. Devon does all the lead vocals and plays the guitar but he also has some guests on a few tracks like Huey Lewis (opening track), Ron Holloway (title track), Rick Stef (keyboards on many tracks), Bobby Yang, and Tony Antonelli (percussion). Could Get Dangerous starts the record off and it has a slightly funky guitar and features Huey on harmonica. The guitar solo parts are very Warren Haynes inspired but not as good. Space Age Blues borrows (or steals) from Warren Haynes’s track, Gambler’s Roll, quite directly. I wonder what Warren would think if he heard this? Ron Holloway plays some beautiful sax as always. Salvation is a slow bluesy track and I was quite stunned to hear him play an almost exact copy of the guitar solo from Soulshine, another Warren Haynes track. How can he do that?? The track is also similar but not exact. Sir Duke is a pretty cool version of the Stevie Wonder classic. Endless Diamond has quite a lot of lyrics and has a bit of a harder edge than the other tracks so far but is still modern blues with a little spacey edge with the keys and a bit of delay guitar. Bleu Est le Vide is a short acoustic song. Warm in Wintertime is slow blues for late at night with these terrible pop emotion keyboards that I hate. New Pet Monkey starts with some piano and is a bit darker track and he sings in a bit different style as well. A nice change and Ron plays some killer sax as well. I’m Ready comes back with a funky more dirty guitar riff. Take Me to the Bridge is again a more aggressive track with some cool wah solo guitar. Devon really pours some power into his vocals on this one. The CD ends with another instrumental track, Insh Allah, which features his best guitar of the entire record. A great track. He even plays a kaossilator pad! IT is a solid record but I will never be a big fan of this mostly laid back, polished blues rock with a lot of other influences as well but just not enough grit or rock in it really, despite some great songs. He is very Warren Haynes inspired when it comes to his guitar solos, a bit too close, even ripping off the master directly.